I've been writing about London's first forays and then larger leaps into the speciality coffee world since I started this blog in 2007. Last year, to try to rectify the fact that some of my oldest favourites were among the most sparsely documented on this blog, I updated my reviews of spots like Flat White, Fernandez & Wells in Beak Street and Workshop's Clerkenwell café (which I've loved since its St Ali days). Sadly, the latter two have since closed... I hope it wasn't something I said! I compiled my first concise London coffee guide in 2011, updating it in 2012 and 2014. I've long been meaning to compile another update but I knew a top ten would barely even scratch the surface these days. And because friends, family and others often ask for my recommendations, I needed something more in-depth. 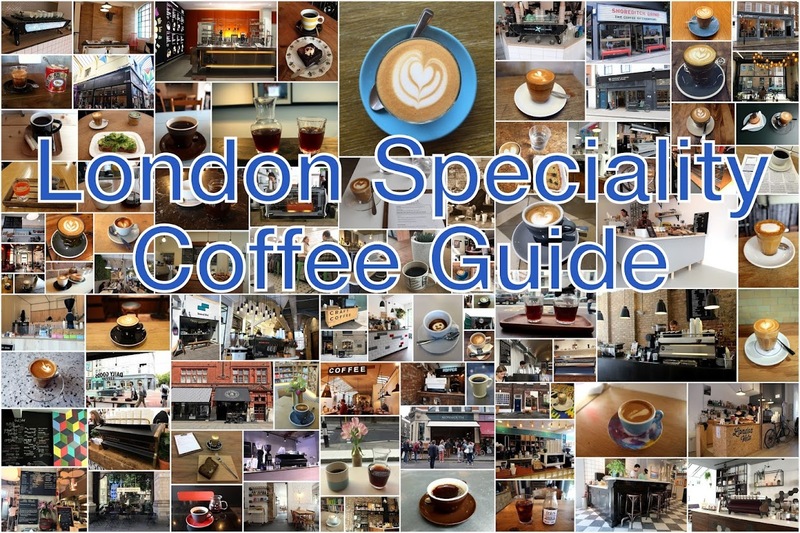 Here, then, is a guide and map comprising 100 London speciality coffee shops and cafés, from Crouch End to Clapham and Dalston to Deptford. These are my personal favourites based on my own experiences and by no means represent a fully comprehensive list (scroll to the end for some of my favourite London coffee websites and blogs) — there is a central/eastern bias, for example, as I live in Bermondsey, work in King's Cross and rarely venture west of Hyde Park. I've written about more than 100 coffee spots over the years, and visited more still but some have since closed and some have changed. My tastes have changed too, especially as the city's speciality coffee scene burgeoned and boomed, spreading from Soho and Shoreditch, into other central areas and then way beyond. As with my New York coffee guide, some of the featured venues have sister branches, and rather than listing every location I've visited, I've selected my favourites. I still have a long coffee to-do list for London and I will be updating this guide and map over time, but asterisked venues below (purple in the map) are my current favourites. I've linked below my reviews, and for more information, including my photos and details of other branches, please check out my accompanying Google Map. Finally, this Flickr album includes many photos of these and other London coffee spots. My list is far from comprehensive but luckily, there are myriad resources for finding the best coffee in London. The London's Best Coffee website (and accompanying Best Coffee app) is my first port of call when visiting a new neighbourhood. And if you're interested in the history of London's coffee shops, editor Phil Wain's fascinating and thorough five-part series is a must-read. Some coffee blogs with particularly good coverage of London coffee shops include: Bean There at (they can fill many of the West London gaps in my map), Bean Thinking (for a scientific take), Brian's Coffee Spot and Cups of London Coffee. And only last week, while I was finishing off this guide, I spotted James Hansen's excellent Eater shortlist of 15 of London's best coffee shops, which has added a few cafes to my to-do list. Finally, if you prefer your coffee recommendations in print format, check out Caffeine magazine for suggestions in London and beyond.